This month is nearing its end. Oh hello there reader. Yeah this is my first post this year and there are no conventional greetings and new years resolutions. All work and little fun make for not much writing. Either way I finally feel like writing again. 2018 has started and I am finally realising it. The last week before the 31st of December was so busy I was spent before I could celebrate. Then the week after it was busy again so sleep was more important than anything else. Now after about three weeks I feel I can reflect a little bit. This year is all about long-term goals and achieving them. That does not sound exciting but then again think of long-term goals like chess. Chess does not look exciting but the process of becoming better at it and winning the game are intense. Once you see the possibilities you understand what you have to do. Right now I have the privilege of enjoying some music. I started with Daft Punk and now The Clash is playing. Making time to listen to music is one of the hardest things to do when you are often to tired to even read a book. Even so you have to do something to not get caught in the drag of your daily routine. Oh yes, that watch on the picture is a new one. 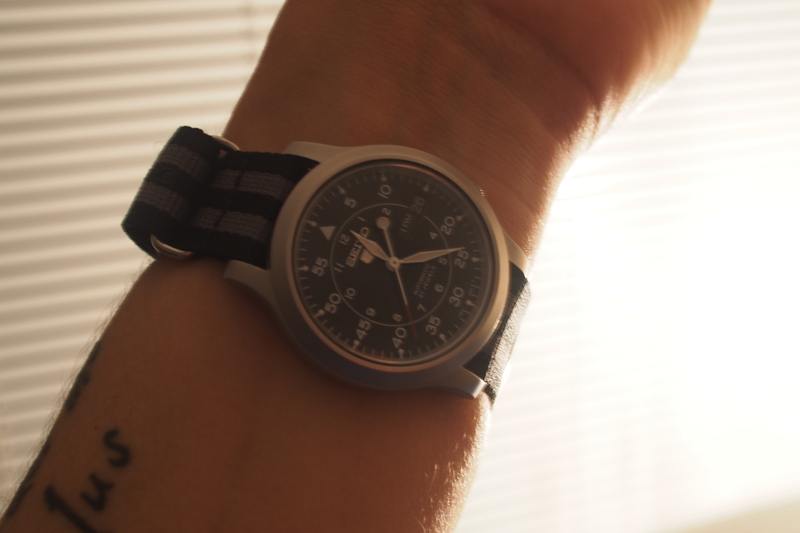 A small Seiko 5 on a nato-strap (nato means military specification!). The day-date function is very handy. It is an automatic watch thus it does not need batteries. Even on a budget you can find amazing watches. Now back to the point of this post. I am not sure there is a point. The most I can say is that time quickly passed. A picture of a watch showing the date and time seem fitting. Life goes on. Posted in Short Reads and tagged 2018, 26-01-2018, Daft Punk, January, life, music, nato-strap, Seiko, The Clash, watch, writing on January 26, 2018 by rura88.